A nursing assistant at Cromer Hospital is one of the stars of a new national apprenticeships campaign. Fire It Up has been launched by the Department for Education to raise awareness about the huge variety of apprenticeship options available for people of all ages and backgrounds. 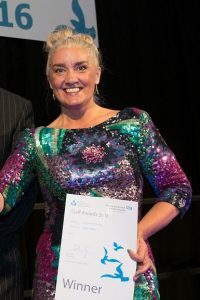 Sarah Eley joined the Trust as an apprentice in 2015 after 30 years of working in an office as a customer relations manager and is now a nursing assistant in the ophthalmology department at Cromer Hospital. She said: “No-one thinks you can retrain for a new career in your 50s, but I’m proof that you can. I applied for the nursing assistant apprenticeship scheme at Cromer Hospital and since doing it and working in the hospital I feel I am a happier person, I’m more fulfilled.